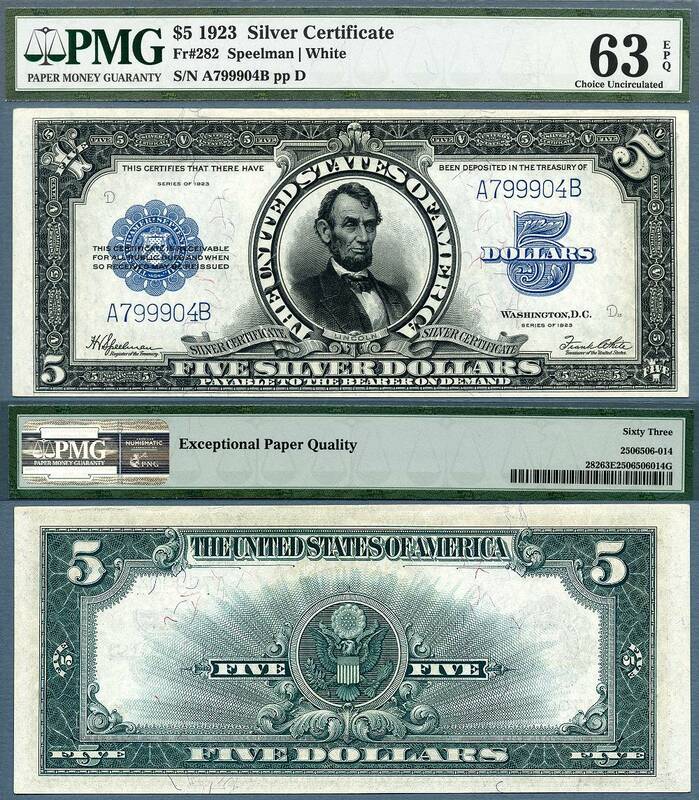 The last issue of Large Size Silver Certificates printed by the United States were dated Series of 1923. Only $1 and $5 denominations were issued. The $5 note popularly called the Lincoln Porthole features our 16th President, Abraham Lincoln, framed inside a circle. The portrait of Lincoln was based on a photograph by Anthony Berger, and engraved by Charles Burt. Though simple and stark in appearance, this note has gained popularity among the collecting public as one of the most desired of all currency types. The major design on the face is the vignette of Lincoln. Four distinct numerals are used on each corner, unlike the previous issue of 1899, which used four identical numerals. Blue serial numbers, seal and an additional blue numeral 5 are the only other designs on the face. The back of the note, printed in the usual green ink, displays the obverse of the Great Seal of the United States with rays emanating away from it. There is only one signature combination for this note, that of Speelman and White.